. Glad to see them back promoting their product. Sale will last until September 15th. Also check out prices on hoodies and polos! So, on Monday, August 18th, I’m turning 26. I’m printing up loads of stuff in preparation for Renegade Chicago (which I’ll be flying up for Sunday, Saturday the booth will be running without me), and I’m working on some new designs, so what better time to have a little flash in the pan sale? Just use coupon code BIRTHDAY for 26% off through August 21st. I even put up the new shirt by my friend Hellen Jo, entitled Oh Crap, Run Away! 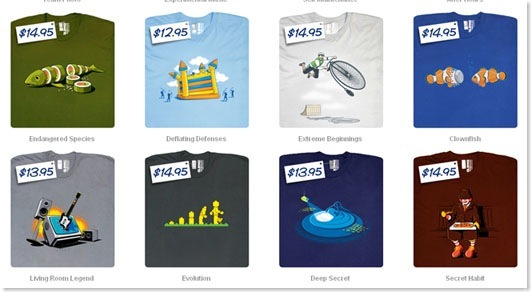 5 total designs on sale for $5. Extremely limited sizes! Its really un-heard of (at least I have never seen it) to see an organic t-shirt sell for less than $10. Hurry and grab yours. All of our 100% Organic Cotton T-shirts will be on sale for less than ten bucks. Including $5 for all of our printed infant apparel and toddler T’s. Up to 70% off on all shirts. Grab this design for only $12 – not bad at all I must say. Shipping on these items will not start until July 16th, but for the price its worth the wait. Free shipping if you purchase 75 or more.